Particularly in the realm of electronic dance music, many top DJs primarily program their sets based on harmonic mixing. In other words, records should be in compatible keys, and sound harmonious. Some of my favorite DJs such as Sandra Collins, Hernan Cattaneo, Paul Oakenfold, Steve Lawler and Dubfire rely primarily on harmonic mixing. In the world of high-energy trance music, not only are successive records programmed in compatible keys, but they tend to be steps up the musical scale, contributing to an effect of increased energy, as the DJ works his dancefloor towards a euphoric peak. Mixed in Key is a software product that has been developed to determine the key of a particular song. Then, using the Camelot Wheel pictured below, a DJ can pick harmonically compatible songs. Please, do not confuse the Camelot Wheel with Pat Sajak's Wheel of Fortune! Using Mixed in Key, select an MP3 to be analyzed, and in about 30 seconds, the software program will reveal a code corresponding to a particular key. For example, "Mr. Saxobeat" by Alexandra Stan was tagged as 10A, or the key of B Minor (see 10 o'clock). 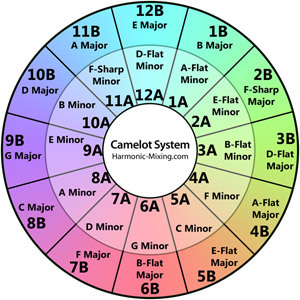 According to the theory of the Camelot Wheel, compatible keys would be another song in B Minor (10A), one step up to F-Sharp Minor (11A), or one step down to E Minor (9A). The "A" codes refer to minor keys; the "B" codes refer to major keys. According to Mixed in Key, "You can also mix between inner and outer wheels if you stay in the same 'hour.' For example, try mixing from 8A to 8B, and notice the change in melody as you go from Minor to Major." Back to Saxobeat (10A, B Minor), some potential songs in a similar beats per minute (BPM) and style that could be compatible under the Camelot Wheel include My Feelings for You - Avicii (11A, F-Sharp Minor) or Down on Me (Disco Fries Remix) - Jeremih (9A, E Minor). One popular mix among mobile DJs is the Michael Jackson "Bille Jean" into Justin Timberlake's "Sexyback." According to the Camelot Wheel, these records, although while both in minor keys, are not really compatible, at 6A and 2A, respectively. However, Dev's "Dancing in the Dark" at 6A, would be a harmonically good match for Bille Jean. For a sample of a harmonically mixed set, visit this page on the Mixed in Key site here, and look on the right side of the page for the blue audio wave forms that say "Audio Demo of Harmonic Mixing." Can you tell the difference? As mobile DJs, we are often expected to bang out the hits of a strict playlist and may not have the flexibility to mix harmonically. However, when given free reign to mix, as DJs we should strive to keep our dancers locked into a groove with a harmonically sound mix. To truly achieve a seamless mix, listeners should not discern any changes in the incoming record that could be detected due to a jarring key change! 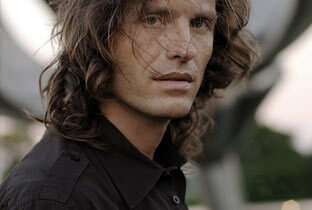 DJ Hernan Cattaneo - His harmonic mixes are seamless! A word of caution - just as it would be unwise to solely program a set based on beats per minute, so too would it be foolish to pick records solely on the Camelot Wheel. Rather, it is just another tool for a DJ to pick the perfect record for the perfect moment, and tell a story!